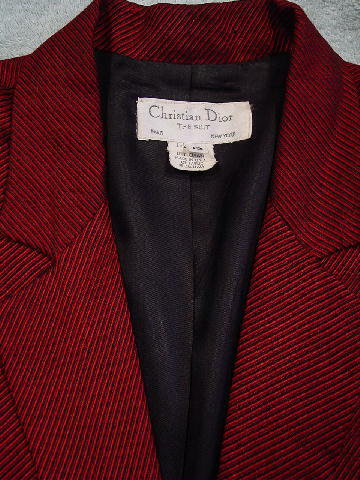 This vintage jacket is by Christian Dior. 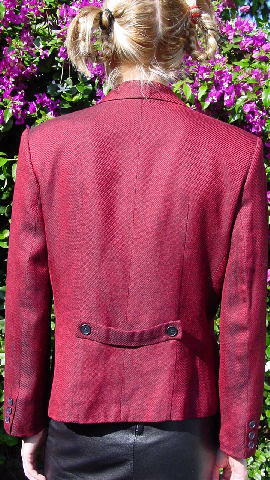 It has long lapels, shoulder pads, and a one black button front closure. There are two lower open front pockets and long sleeves with 3 buttons on each. It has a diagonal thread line pattern in red and black. There are some thread pulls, but they only add to its charm. It has a nice black lining. There's no fabric content tag, but it's soft and probably a wool blend. shoulder pad to shoulder pad 23 1/4"